The short version of our trip to Israel is that Sharon and I were with two of our pastors to help them facilitate a First Steps discipleship conference to primarily Russian Messianic Jewish pastors, and to speak a few minutes about our marriage testimony and our marriage ministry. We had a great time and learned a lot. Now for the longer version. I am going to get into quite a bit of background and details because I think it may help you have a better understanding of who we are and some of the people and experiences that have influenced us. We traveled with Grant Edwards, our senior pastor from Fellowship Christian Church in Springfield, Ohio, Rick Ives the missions pastor from Fellowship, and Russian interpreter and administrator of Russians Reaching Russians, Denis Koslov. Grant grew up in a local church in Springfield but as a teenager made a decision to leave the faith and became a hippie and drug user. When he was 19 he had an encounter with Jesus who set him free from the drugs and gave him a passion to reach out to his friends about Jesus. Within months of his conversion he had led over 100 of his friends to Christ. However, he saw many quickly fall away. This greatly concerned and frustrated him, so over the years he developed a program originally called Discipling Another to Love Jesus and but now called First Steps. This is a 10-week program that is designed to be used one-on-one with new believers or older believers who never got a good foundation in the faith. It helps them understand the fundamentals of the Christian faith and how to walk it out. First Steps has been used across the U.S. in churches and prisons and in many foreign countries such as Russia, the Philippines, Cambodia, Cuba, India and more. The early days of Grant’s ministry were mainly a youth ministry. Sharon got involved when she was 14 and accepted Jesus and I got involved when I was 16 years old. By the time we were married the ministry was morphing into a church. Grant was one of the co-pastors that officiated our wedding. Rick Ives grew up an atheist and then got saved. About 22 years ago he was a youth pastor in Indiana. He and his wife Heather took a trip to Israel and were on the flight home when he had a very strong impression that they were to move to Russia and start a ministry – not too long after the “wall” came down. He had no desire to go to Russia, but in obedience he did and lived there for about four years helping start churches and grow relationships. Grant never had a desire to go to Russia but felt led by God to go visit Rick and Heather, even though he had only met them once when they visited our church networked by some people they all knew in common. They hit it off and have been working together ever since. Sharon went on her first missions trip to Russian Orthodox Jews in New York City and then she, Grant and many others went on a missions trip to Russia in 1996 and met up with Rick and Heather. A year or two later the kids and I went to Russia with her. Sharon has now been six times and I have been five times all to the St. Petersburg area ministering in churches, orphanages and more. After four years in Russia, Rick and Heather moved back to the States, and then eventually moved to Springfield for Rick to work at Fellowship. Rick overseas all of our church’s missions around the world, still working closely with Russia. Denis Koslov grew up in Russia and became a Christian. He had an interest in America for years which eventually led him to become an intepreter. Early in Rick’s Russia ministry, Denis started interpreting for Rick and the teams that visited and is now the chief interpreter as well as the Russian administrator of Russians Reaching Russians. Plans are being made for his family and him to move to Ohio in the next year to take over more of the active management of the ministry and to lead American teams to Russia. When Sharon and I first met Denis he was in his early twenties still learning the basics of the faith . . . and English. About the same time we met Denis we met another young Russian, Yan Volkov. He was just out of prison, had a sweet spirit about him and really took a liking to our kids. 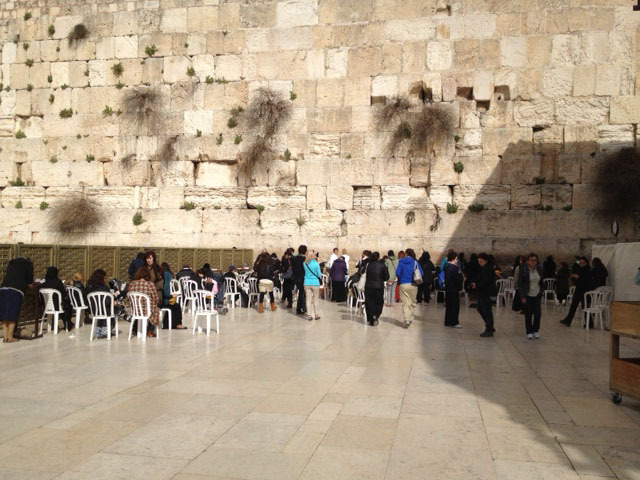 A year ago we went went on a guided tour of Israel with a group from our church. We saw many of the important Biblical sights in Israel and really learned a lot but did not interact with the people much. At the end of that trip Grant and Rick extended their stay to meet with a couple of Russian pastors that Yan Volkov had told them they should see. Yan is now very involved in TBN/Russia. 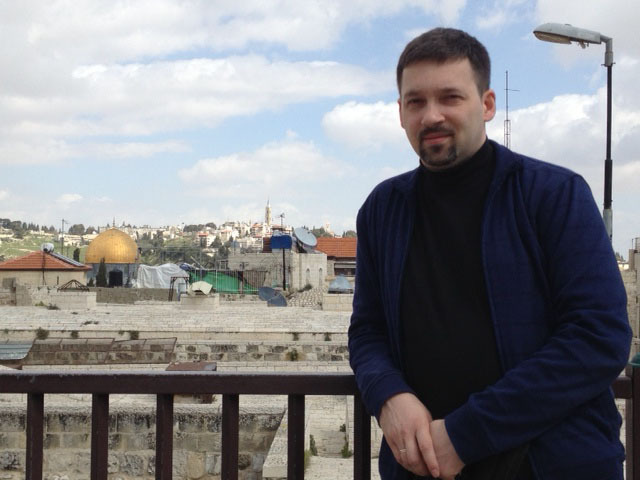 There is a huge contingent of Russian Christians in Israel, many with a Jewish background. 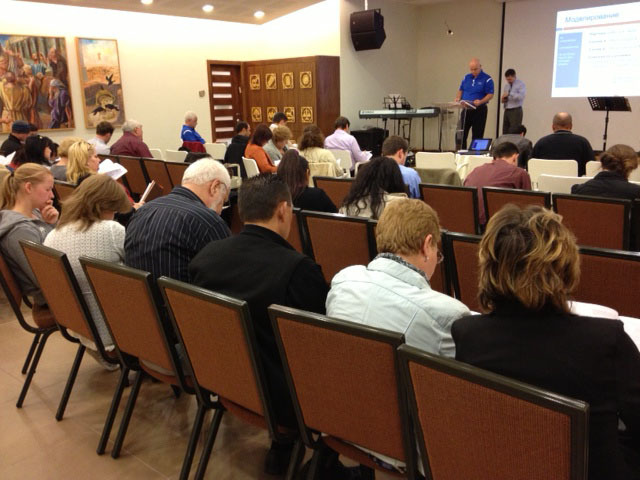 In that meeting a year ago Grant and Rick laid the foundations for the First Steps conference held this year. 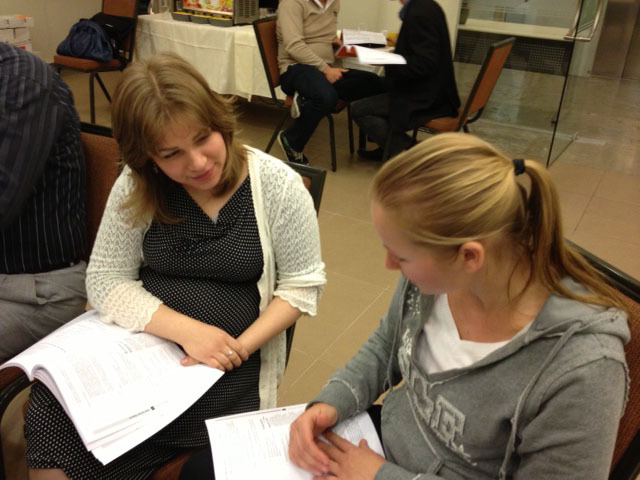 What Sharon, Grant, Rick and I knew before our trip this year was that we would be presenting a First Steps conference to primarily Russian Messianic Jewish pastors in Tel Aviv. Sharon and I had been asked to go along to share about our marriage testimony/ministry depending upon the time available. 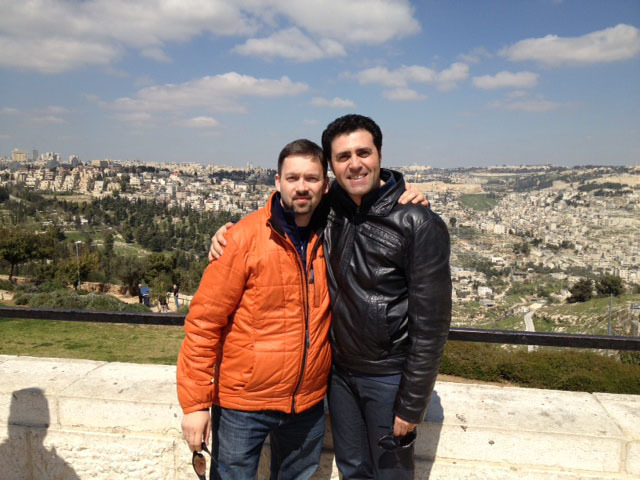 We also thought we had a couple of mostly free days in Jerusalem to just enjoy the time there. Our first full day in Tel Aviv was their Sabbath and our hotel was on the beach of the Mediterraean within a couple of miles of Jaffa. A lot of people were surfing, riding bikes, walking and just enjoying the weekend and the marvelous weather. It was warm compared to Ohio but not warm enough for me to be in the water. It was a gorgeous day to be outside and we got to see people do some traditional dancing, playing paddle ball, and playing volleyball with no hands. Grant, Rick and Denis rented bikes and road to Jaffa. Sharon and I took a taxi. 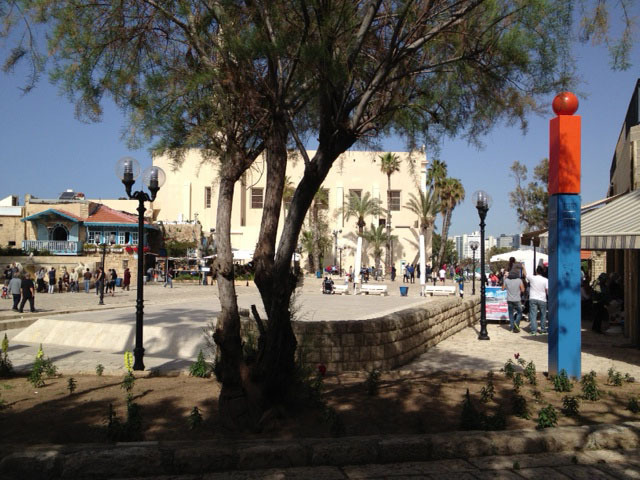 Jaffa is a very old port city and was the town where Peter had the vision of the sheet at Simon the Tanner’s house showing him that God wanted Gentiles to be welcomed in the church. It was awesome to sit in our hotel at night and see the lights of Jaffa and realize that so many years ago, right in that town, God had supernaturally communicated with someone to welcome Gentiles (i.e. us) into the church. Our second day was the conference day. We were stunned when we got there. Not only were there Russian speaking pastors, but people from the Philippines, Congo, Ethiopia, Israel, China, America, France, and native Israelis. Some spoke English and some didn’t. Mostly their native language and Hebrew. One of the pastors spoke five languages and as he came down the row I heard him greet people in Russian, Hebrew, and English – switching languages as he went down the row. It was amazing to realize that the scripture about God regathering His people from the four corners of the earth back to Israel is being fulfilled before our very eyes in this time. Because of traffic concerns the conference started later than planned and ended earlier than planned so Grant and Rick did what is normally a one-and-half-day conference in about four hours. We were able to speak at lunch about our testimony and ministry for about ten minutes and I think between the inquiries we got and that Denis got there were about nine separate people who wanted to know more about what we do. It was a great response for the limited time and we were so honored to speak. The next day we packed up and left our hotel in Tel Aviv and went to Haifa to meet a couple of Russians Messianic pastors who have converted an old monastery into a Christian community dedicated to helping people come out of drug and alcohol addiction and starting over in life. They not only have a mission there in Haifa but have some rehabilitation houses in Pennsylvania. 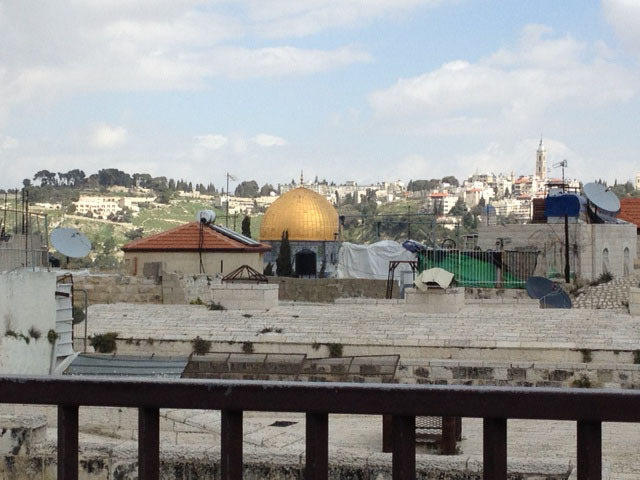 Later in the day we moved on to Jerusalem. 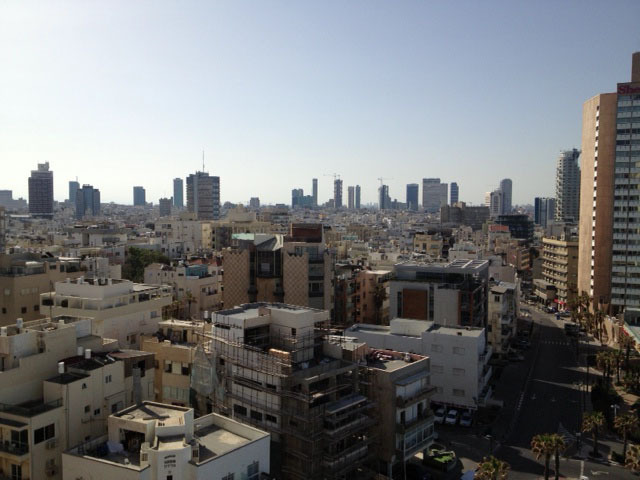 Grant and Rick had been invited to meet with the pastor who is the voice of TBN in Israel. They taped a segment about First Steps that was interpreted into Russian. Unfortunately, I had a little detour and was unable to go to the taping. About a month ago I had a crown put on a tooth in America. Everything seemed in order and I hadn’t been experiencing any pain. In other words I thought my teeth problems were good to go. 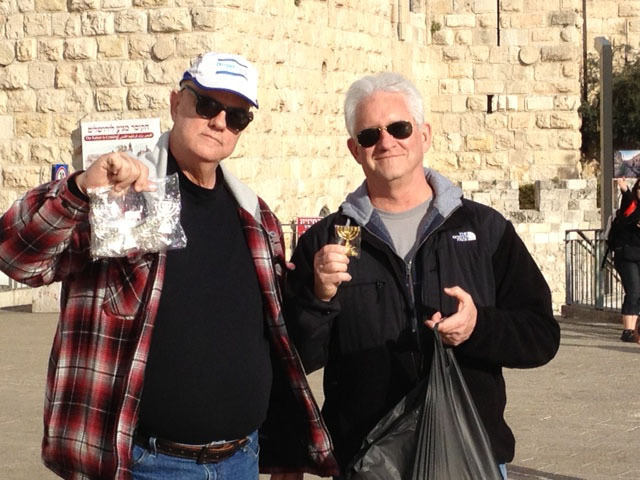 After I got to Israel I started experiencing some tooth pain, so I began using some pain killers and antibiotics. By the time we left Tel Aviv my face was starting to swell. I was in contact with my dentist at home and as I continued to worsen he told me I needed to find a dentist now. My wife and teammates were growing concerned. After we checked into the hotel in Jerusalem I asked the front desk if they knew of an English speaking dentist. She commented that my face was swollen and promptly got on the phone to find a dentist for me. Fortunately she found one who would see me after business hours and who was a short cab ride away. She gave me directions to the dentist in Hebrew and handed me a business card with the hotel address in Hebrew and called a cab for us. We had no idea what it might cost and we knew we had to pay in cash so we counted our dollars for the dentist and for the cab and prayed it would be enough. The cab took us right there. The receptionist and the dental assistant spoke no English but the dentist did. He had to remove the crown and do a root canal and put back a temporary crown. He gave me a prescription for an antibiotic that we were able to get filled in the same building. We were thankful the bill was only about $350, and my swelling and pain were arrested. I will have more work done here at home, but was so thankful that Jesus provided me with the help I needed so I didn’t get worse, especially for the plane ride home. 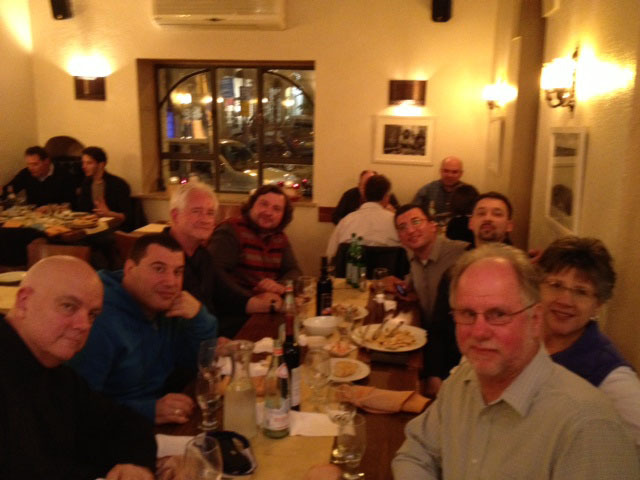 We had dinner that night with three pastors – one from Siberia. The next day the pastor with TBN invited Grant and Rick to speak to his church leadership team and we went along. It was basically a round table discussion about leadership principles and I thought it went very well. 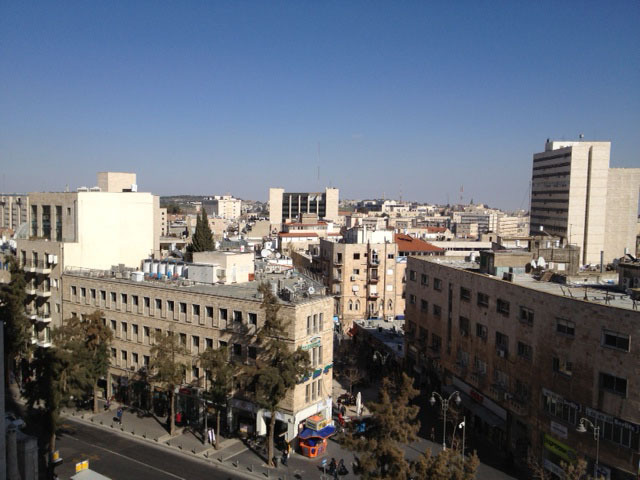 In the afternoon we went to the markets in Jerusalem. I hate shopping in general and thankfully there were three men and Sharon – who is not a window shopper, but if she knows what is needed she does a good job finding it and bargaining for it. Bottom line is that she acted as a personal shopper for Grant and Rick and kept bargaining with the shop keepers to get good deals and I mostly hung out and people-watched. We did get to the Western Wall also known as the Wailing Wall. The wall is actually part of what is left of platform from Herodian times that the temple was built upon. I think we all had a realization that although it is a very revered place, being with our Christian brothers and sisters was much more moving than being at the Wall. Yes it is special, but the people are so much more special. On our last day a multi-lingual pastor who is the head of the association of churches that invited us over took us for a drive in the area around Jerusalem. We had some incredible and encouraging conversations with him. He took us to a kosher Jewish bakery which was a special treat and then showed us his office in downtown Jerusalem with a beautiful view of much of the city. He also took us to the overlook in Jerusalem where all the major news media do their reports. It was amazing that he, Grant, Rick and Denis had various common friends around the world – in Russian and the Philippines especially. Sometimes in these international situations I can feel like such a slacker. I meet these people that speak multiple languages and I struggle with just English. Then they know a lot about America and what is going on here, and I know only a little about what goes on in their country and often about half of what I know is wrong because it came from our media. But it is wonderful the kinship you can feel as Christian brothers and sisters even though we come from very different cultures. So many things on this trip just blew my mind. When I think about the early Russian trips and Denis and Yan being so young and now Yan is well known and has contacts not only in Russia but in Israel. Denis was just an interpreter but now is a pastor with contacts all over the world. It is just amazing to see their growth and what God has done in their lives. When I think about my youth listening to Grant preach when he wasn’t through Bible college yet, and my vague memories of Sharon as a very shy teenager. We are all from a relatively unknown town and now are half way around the world ministering. It is amazing. 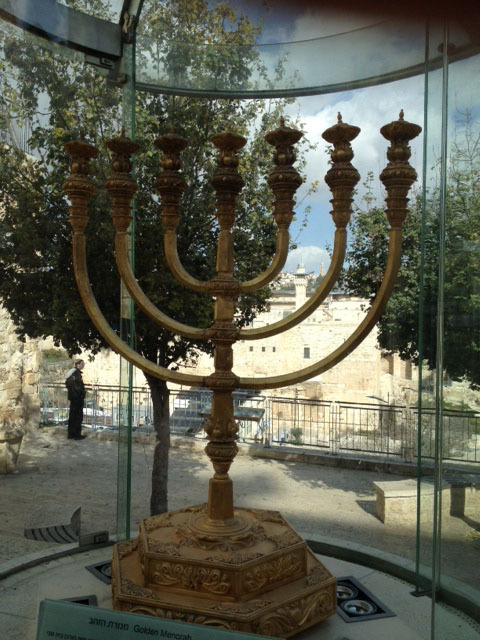 When I see the Bible coming to life with the Jews being regathered in Israel – it is stunning. When Grant, Rick, Denis and our hosts start talking and in one conversation they are mentioning people they mutually know from around the world and common places they have been, it is very interesting. When I walk through Israel and Jerusalem and see Bible sites that I have read about for years it encourages my faith. We don’t know if we’ll ever go back to Israel, but we are grateful for this time meeting Jewish believers and learning more about their way of life. This entry was posted in Separation. Bookmark the permalink. Thank you for giving us a ride-along tour with your writing and photos. Israel changes you from the inside out in every way, doesn’t it? We are thrilled to see the ways God is allowing you and Sharon to serve Him overseas. Thank you for stepping out and reaching out…being His feet and His hands.